Please welcome today’s aspiring author, Cary Brunswick, ready for a peer critique. Take a moment to read the excerpt, then please leave some thoughtful feedback in the comment section below. If you are a writer whose excerpt has appeared anonymously on Write It Sideways, and now you’d like your name to appear on your piece, please contact me. If you’re interested in submitting an excerpt to be critiqued, keep an eye out for future calls which are advertised here a couple of times per year. The buck tensed, as he stood hidden between the two spruces, watching the hunter below trudge through the leaves and begin climbing the opposite hillside. The buck must have sensed that the hunter was eager to find a lookout from which he could spot deer. The hunter then would call his buddies and tell them where to find them. Clad in an orange coat and cap, and brown, insulated pants, the hunter clawed his way up through thick undergrowth. As he neared the top of the rise, he caught a glimpse of a platform high in an old oak tree that he figured some ambitious hunter constructed some years back. The stand was high, maybe 50 or 60 feet up, and the man-made steps were missing until you reached maybe 25 feet. He stood at the base of the tree looking up, trying to decide if it was worth the effort to make the steps necessary to get to the platform. The next day, the hunter came back with nails, 1-by-3 fir strips and a 20-foot rope ladder. He told his friends he’d call as soon as he made it to the lookout. As the hunter slowly made his way up the tree, nailing slats as he went, with his rifle slung over his shoulder, the buck and two others watched from their spruce row. The shocked hunter wasn’t sure how to respond at first. Hanging onto an edge of the platform with one hand, he tried to slide his rifle down his arm. It slid too quickly, however, and, trying to keep his grasp on the strap, he lost his balance and fell from the tree. He broke his fall a bit by latching onto branches and slats, but he fractured a leg and an arm when he hit the ground. 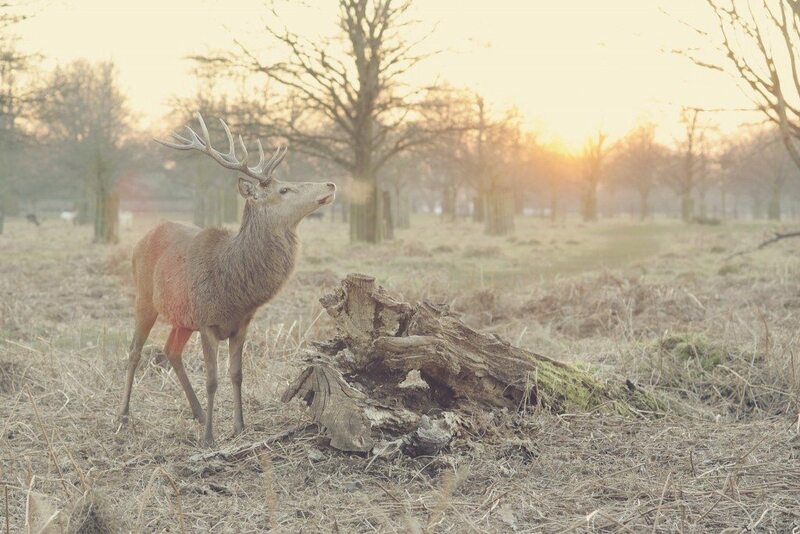 He lay there groaning, trying to fetch his cell phone from his coat, when he sensed the bucks glaring down at him. Cary, this is a great lesson in poetic justice … the hunter is snagged in his own device. Love the concept. I think this has a good POV, you let the reader see both the over zealous hunter, yet put the concentration on the buck and his fellow deer. Disappointing….Lack of tension, inconsistent theme and mixed POVs. I never did get a picture of the hunter and I had trouble figuring out who was telling the story. If it was supposed to be an omniscient narrator, it should have presented more insight into the characters. Gist of the story is”whoever digs a pit for others falls into it”. The title of the story is also good, BUT the buck & hunter as characters is REVEALED in the 1st line itself. Well, I unsuspended my disbelief when the deer charged the tree. That’s fantasy-deer and if you really want it, you have to prepare for it. Deer are small, you know, which is why family back in Idaho hunt big elk. It’s got some good bones/ideas and by the end it did have my curiousity going. Intriguing idea. Because I write from animals’ POV often, I want the story to start from where the buck is glaring at the hunter. That would have made me read on because it caught my curiosity. I think you have a nice outline for a story here; it is not complete. Read “Story Engineering” by Larry Brooks to learn how to make this idea into a dramatic story. Don’t stop. I like your deer, and he and the hunter might strike up a relationship that will benefit both. Maybe the buck is Bambi’s dad and he’s furious because this is the hunter who killed his mate, Bambi’s mom. Just rambling . . . The story has a good beginning and it keeps the reader’s attention while wondering where it is going to lead. However, I cannot see a hunter nailing slats with a rifle over his shoulder (maybe on his back with the strap over his chest? ).”The buck and two others (what?) were watching…” Also how did he “reach over the platform” did he grab the platform or try to climb onto the platform? Finally, you might sense the presence of “something” but not know that there several bucks until you see them. I love the premise. The hunter becomes the hunted. I would cut the first four paragraphs. Just set him up returning and the buck watching him. The first 4 paragraphs are expostion and I was a bit bored. Drop into the action. Something like that. Drop the deer’s POV. Omniescient POV is very difficult. Limit one scene to one POV. I would also delete the friends. Why would they wait at a unknown location for this dude to climb a tree? Last, show us the man’s fear. Slow down the action as he falls out the tree. Show us the panic as he grabs for a ladder he can no longer grasp. His body as it twists trying to stop his fall and then the pain as he hits the ground and breaks his legs and body. and then realizes his fall didn’t chase away the deer, and they are staring down at him. I really would like to see this narrative written from a first-person perspective, either that of the hunter’s or one of the buck’s. Also, using more dialectical terminology would add extra color and implied insights into the hunter and the bucks. The concept of being “hoisted by your own petard” is certainly a worthy one, of course. The behaviour seems odd for deer. I get the watching part, but the circling with abandon, while good for the story, just does not seem like the kind of thing the bucks would do. While he may have sensed the bucks after he fell, I doubt any of them would be anywhere near him. When I re-read it, it struck me as odd that the guy would carry his rifle while he nailed the first few steps, and why did he have the rope ladder. I have never been hunting in my life, but these are my thoughts. I wonder if the author has. An excellent p-o-v opening that sets the scene, although you might consider expanding the first graph (just a little) to verbally paint a bigger picture of the vast wildness of forest and plain a surrounding the central action. Who knows, a certain sense of solitude might reinforce your story later on. Still on the first graph: “The buck must have sensed that the hunter was eager to find a lookout from which he could spot deer.” This certainly goes beyond the ol’ predator-prey, fight or flight mentality we associate with most wild animals. It seems that you’re attributing a much higher degree of intelligence to the deer and, if that’s what you’re after, you’re probably much (underlined) too early in your story set-up to bring this concept forward to the reader’s mental multitasking. Again, if this is what you’re going for, consider working in in a little at a time and a little further in. Same graph: “The hunter then would call his buddies and tell them where to find them.” Same problem, only more so, the establishment of a super-intelligent deer this early in the story. You might consider being a little more subtle and gradual in defining the deer’s mental processes, especially in the area of pre-cognition (i.e., knowing the hunter “would then call his buddies and tell them…” Perhaps it might be better to edit and move this line into the next graph and show that this is the hunter’s (underlined) frame of mind upon finding the platform, but then deciding against it when he discovers that he’ll have to return the next day to add an improvised ladder step-up to the bottom of the tree. I enjoyed the ending jeopardy! Made me wish I could read more – and there’s nothing ever wrong with that.